The Grounds hosts the 62nd annual Greater Gulf State Fair Oct. 28 through Nov. 6, featuring 30 adult rides, 30 kids’ rides and more than 40 food and beverage vendors. For more information call 251-344-4573 or visit thegroundsmobile.com. The Schooner America, a replica of the racing yacht that won the first America’s Cup sailing competition in 1851, will be visiting GulfQuest Nov. 4-8. 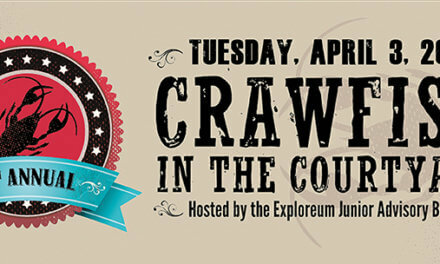 For information or tickets visit bit.ly/SchoonerAmericaGulfQuest. Join The Hangout for a weekend full of oysters, music and beer Nov. 4-5. Visit the thehangoutcookoff.com for a full schedule and for tickets. Nov. 4-6 is the Alabama Pecan Festival at 5055 Carol Plantation Road in Theodore. Admission is free and there is plenty of fun for the whole family. 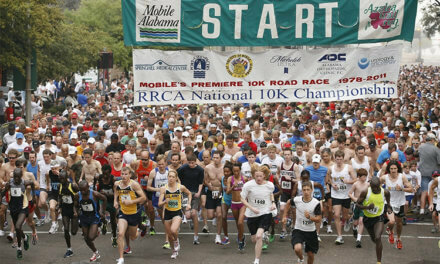 For more information call 251-401-5555 or visit alabamapecanfestival.com. Magnolia Cemetery will host three free tours the first three Saturdays in November, each focusing on a different theme. Tours begin at 10 a.m. and last approximately two hours. Reservations are recommended. Call 251-208-7307 or 251-432-8672. Bellingrath Gardens and Home is collaborating with barre3 Mobile to present a fall workout series in the gardens on the first three Saturdays of November, 10-11 a.m. For details call 251-973-2217 or visit bellingrath.org. The Episcopal Church of the Good Shepherd (605 Donald St.) invites you to attend its annual fall festival, Saturday, Nov. 5, 11 a.m. until 5 p.m. for food, fun and fellowship. Call 251-452-9596 for more information. The city of Fairhope will honor its military veterans with a Veterans Day parade on Saturday, Nov. 5 at 10 a.m., beginning and ending at the Fairhope Civic Center. An ecumenical gathering to promote racial reconciliation, unity and peace. Sunday, Nov. 6, 3-7:30 p.m. at the Daphne Civic Center, 2603 U.S. Highway 98. For more information call 251-458-1810 or 251-510-1915. Sunday, Nov. 6, starting at 3 p.m., come see this fun show featuring a variety of acts including singers, musicians and comedians. Tickets are $5 and are available from any Auxiliary member or at the door. American Legion Post 199, 700 S. Mobile St., Fairhope. Every first Monday of the month from 5-7 p.m., bring your dog to the OK Bike Shop for doggie happy hour and get to know your local animal rescue groups, enjoy live music and more. Head to polls on Tuesday, Nov. 8, to vote. Visit myinfo.alabamavotes.gov for information on your voting location. The Mobile Bay Area Veterans Commission will host a luncheon at Fort Whiting on Friday, Nov. 11, beginning at noon with doors opening at 11:30 a.m. Tickets are $18; reservations should be made by Monday, Nov. 7, by calling 251-431-8621 or emailing nfunderburk@mobilechamber.com. To help pet owners plan for the future, The Haven offers a free estate planning seminar from noon to 1 p.m., Friday, Nov. 4, at Westminster Village, 500 Spanish Fort Blvd. in Spanish Fort. To register call 251-929-2494 or email mgraham@havenforanimals.org. Please join us at the grand opening of Fuse Factory on Friday, Nov. 4, 11 a.m. to 2 p.m., 200 Government St. Co-working spaces will be offered to area nonprofits, groups and individuals serving the public interest. For more information visit fuseproject.org. If you know anyone who is struggling with drug addiction, get them the help they need. Call 1-800-431-1754 or visit DrugAbuseSolution.com. Join Our Sister’s Closet’s Purse with Purpose event Thursday, Nov. 3 at 5:30 p.m. at Heron Lakes Country Club, 3851 Government Blvd. Tickets start at $30. For more information and tickets visit oursisterscloset.org. The Historic Mobile Preservation Society hosts its 4th annual Columns & Cocktails fundraiser, featuring the society’s preservation award honorees. Thursday, Nov. 3, 7 p.m. at the historic Antoinette apartment building, 960 Government St. For more information visit historicmobile.org. Saturday, Nov. 5, join us for a fundraiser for Lisa McEddy Smith, a dancer who is battling cancer. A seminar will be held at 10 a.m. with a class at at 11 a.m. and the dance at 7 p.m. at the Ashbury Hotel. For more information email alldance1@yahoo.com. Care Carnival, a fundraiser for Woody’s Song, a program of The Learning Tree, benefits children with autism. Free family-friendly event on the block of Jackson Street between Dauphin Street and St. Francis Street. Sunday, Nov. 6, 2 p.m. For more information visit www.learning-tree.org. Mobile Museum of Art hosts Night Market on Thursday, Nov. 3, 5-8:30 p.m. featuring wares by artists and artisans. Support your local artists and join the party and shopping fun with great food, drink and live music. 4850 Museum Drive. The Joe Jefferson Players present “The Producers,” Mel Brooks’ 12-time Tony Award- winning comedy. Nov. 4-20, 11 S. Carlen St., Mobile. For more information or tickets visit joejeffersonplayers.com or call 251-471-1534. Tuesday afternoons at 2 p.m. the Fairhope Museum of History hosts a tea and a lecture on Fairhope history. The Nov. 8 speaker will be John O’Melveny Woods, the producer of the movie “Roundup Day Play.” He will also present a slide show, “The Origins of the Real Sherlock Holmes.” For more information call 251-929-1471. The Alzheimer’s Association will hold its second annual Walk to End Alzheimer’s in Mobile’s Langan Park on Nov. 5, in the Mobile Museum of Art parking lot. Registration will open at 7:30 a.m. and program begins at 9 a.m. For more information go to alz.org or call 850-462-5410, ext. 8042. The Senior Bowl will host a 10K, 5K and 1-mile fun run through downtown Mobile ending with a family fun festival in Bienville Square. The event is 8 a.m. to noon Saturday, Nov. 5. Visit seniorbowl.com for more information. Palmer Pillans Middle School hosts a wide variety of classes, including ballroom dance, boxing and more. For more information call 251-463-7980 or visit communityactivates.com. Every Tuesday from Nov. 1 through Dec. 13, come learn to belly dance at Palmer Pillans Middle School. For more information call 251-208-1662. In this three-hour, hands-on workshop, participants will learn how to tie LED lights to decorate a metal 3-foot-tall Christmas tree. Saturday, Nov. 5, at 9 a.m., Bellingrath Gardens and Home. For details or to order tickets call 251-973-2217 or visit bellingrath.org. Mobile Fire-Rescue will offer free community CPR classes at Murphy High School and Davidson High School over the next several months. All classes start at 5 p.m. beginning Tuesday, Nov. 8, at Murphy and Davidson high schools. Call 251-208-1659 or 251-208-1600 to register.